Msgr. 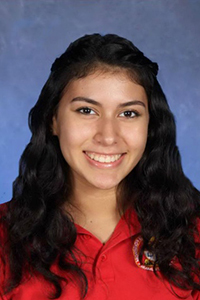 Edward Pace High School senior Vanessa Perez-Robles attended Yale University’s Young Global Scholars Program last summer. She is now one of only 100 college-bound students nationwide to receive the Amazon Future Engineer Scholarship, worth $ 10,000 a year toward her college studies at Dartmouth. MIAMI GARDENS | Vanessa Perez-Robles, a Dartmouth-bound senior at Msgr. Edward Pace High School, has been named one of the first 100 recipients of Amazon’s Future Engineer Scholarship Program. She will receive a $10,000 scholarship, renewable for up to three years or until a bachelor’s degree is earned, as well as a paid software engineering internship during the summer following her freshman year of college. Vanessa heard the announcement March 26, when she was called to the school's administration building and presented with an Amazon box containing the award news. A happy group of classmates, faculty and staff were in attendance to cheer for her hard-earned accomplishment. After shedding a few tears of joy, Vanessa called her mother to share the news. “I feel extremely blessed to have been selected as a recipient and so thankful to all of the teachers and counselors that stood by and supported me through everything,” Vanessa said. She added that the Amazon scholarship will relieve much of the stress that comes with the cost of college and will open doors for her as a future engineer. Selection for this competitive scholarship was based on Vanessa’s strong academic performance, leadership and participation in school and community activities. She stood out among other applicants for her educational goals and objectives. Vanessa said she is looking forward to a career in sustainable engineering. This Amazon scholarship was created to help spark a generation of leaders in computer science. Renewal of the scholarship will be contingent on continuation of full-time enrollment in an eligible course of engineering study while maintaining a 3.0 or better GPA. Here's a video of Vanessa receiving the news.